410 pages | 15 B/W Illus. The nature of human resource development (HRD) has been, and remains, a contested topic – the debate was sparked in part by Monica Lee’s seminal 2001 paper which refused to define the discipline of HRD, but has been accentuated by increasing globalization, political unrest, inequality and the erosion of boundaries. Should HRD now be seen as more than ‘training,’ or a sub-function of large western bureaucracy? This book represents a very wide view of HRD: that it is at the core of our ‘selves’ and our relationships, and that we continually co-create ourselves, our organisations and societies. These ideas are hung upon a model of Holistic Agency, and supported from sources as diverse as evolutionary psychology, science fiction, the challenges of transitional economies, and the structural uncertainties of contemporary society. 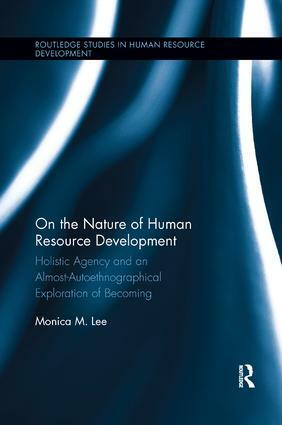 Examining the tensions between self and other, agency and structure, the book draws inspiration from an almost-autoethnographic approach. This yields a text that is personal, entertaining, and easier to read than many academic tomes – yet considers the depth and development of the human condition, and locates HRD within that. Monica Lee is a Chartered Psychologist, a Fellow of CIPD and RSA, and Associate Fellow of British Psychological Society. HRD theory is changing rapidly. Recent advances in theory and practice, in how we conceive of organizations and of the world of knowledge, have led to the need to reinterpret the field. This series aims to reflect and foster the development of HRD as an emergent discipline. Encompassing a range of different international, organizational, methodological and theoretical perspectives, the series promotes theoretical controversy and reflective practice.